Veneers are thin pieces of durable, tooth-shaped, and tooth-colored porcelain custom made at a professional dental laboratory to match your smile. Porcelain veneers are bonded onto the front of teeth by Dr. Chhabra to create a radiant and flawless smile. When in place, veneers can completely transform your smile. In certain situations, veneers can be a good alternative to dental crowns. Veneers in general last for many years and are very durable, but may require replacement with normal wear and tear. Veneers typically require two visits to our office in San Jose. In many cases, little or no anesthesia is required because the treatment is so comfortable. After lightly buffing and shaping the teeth, we will take impressions of your teeth to create your custom veneers. We will also choose a color or shade for the veneers. 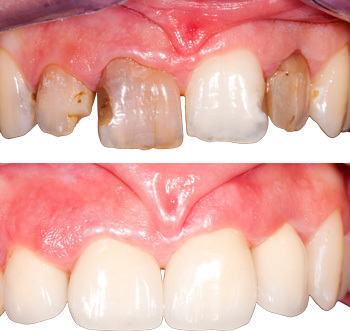 During your second visit, we will apply a special liquid to the teeth to achieve a durable bond. At that point, bonding cement is placed between the veneer and the tooth and we will use a special light to harden and set the bond. Remember to practice good oral hygiene with your veneers to ensure they last a lifetime. For more information on veneers or cosmetic dentistry, please call or visit us soon!